The paper draws on Donella Meadows’ notion of “deep leverage points” – places to intervene in a system where adjustments can make a big difference to the overall outcomes. Arguably, sustainability science desperately needs such leverage points. Despite years of rhetoric on sustainability science bringing about “transformation”, the big picture is still pretty dull: globally at least, there is no indication that we’re starting to turn around the patterns of exponential growth that characterize our era. 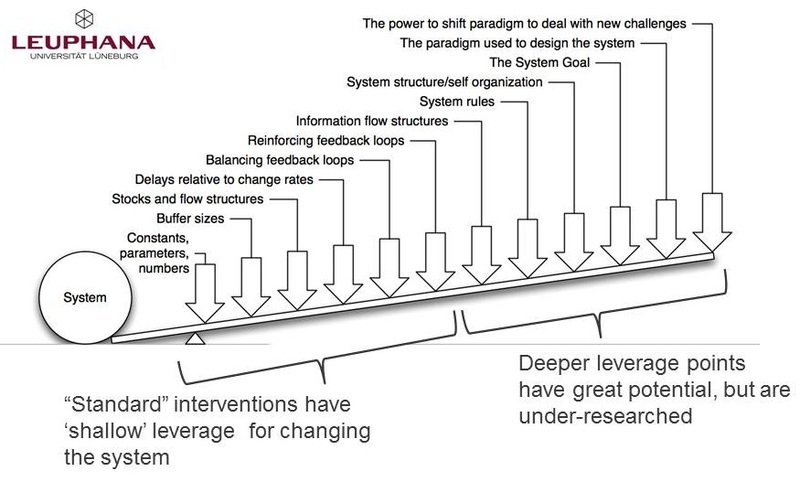 A potential reason is that much of sustainability science has focused on parameters and feedbacks, rather than system design or “intent” (see above) — when actually, it’s changing a system’s design and intent that is most likely to bring about major changes in outcomes. If the goal is to bend the curves, we need to know where to start. To this end, we identified three realms of leverage that can be taken as starting points – reconnecting people with nature, restructuring institutions, and rethinking how different types of knowledge should be brought to bear for the pursuit of sustainability. These three realms of leverage are starting points. If others come up with additional or different realms of leverage that need to be investigated, this would be equally valid. To really find out what’s a good leverage point, we suggest applying a mixture of conceptual, empirical, and transdisciplinary approaches. Finally, we hope that the notion of “leverage points” can provide a boundary object – a common denominator – that appeals to a broad range of audiences. On the one hand, because the idea of leverage points originates from complex systems thinking, technically oriented scientists should be able to engage with the concept. On the other hand, the notion of deep leverage points can also be used as a simple (but powerful) metaphor, signaling that “we need to look deeper” than we have done. Ultimately, digging deeper is what the idea of deep leverage points is all about: sustainability science needs an agenda to confront all those issues that are perhaps difficult to deal with – but desperately need to be dealt with because that’s where potential for real change lies. In a particularly insightful comment to a recent blog post of mine, Jahi Chappell challenged the ultimate benefits of ever-increasing specialisation. Having thought about this a bit, I was struck by the generality of what this may mean. I was amazed by just how often, the problems we discuss in sustainability science result from society having favoured specialisation over balance. In this blog post, I just want to substantiate this observation by highlighting well-known examples where re-balancing would have benefits for sustainability. There is no particular order to these examples. The time budgets of individuals. Let’s start with the point that Jahi raised – the time budgets of individuals are increasingly lob-sided. We’re encouraged to be super-stars (= workaholics) in one thing, rather than spreading our time across a variety of things; rather than “just being” (in Jahi’s words) in our communities. “Academia’s obsession with quantity”, as we called it, is just one manifestation of this general societal push towards specialisation. The time budgets of many modern people appear to need “re-balancing” – to embrace a wide range of things that give meaning, rather than focus on one thing primarily. Global equity. Clearly, to sustainability scientists, it’s no news that the distribution of global wealth could do with some re-balancing. The wealthy nations are causing most of the environmental problems, directly or indirectly, because of lifestyles that require more resources than we have available per capita (on average). At the same time, too many people in poor nations still struggle to make a half-decent living, and lack access to services (education, medical) that are taken for granted in many rich nations. According to a recent Oxfam study (thanks Tim Lang, for your Tweet! ), 1% of the global population owns 48% of wealth and 80% owns only 5.5% of wealth. More balance would be preferable from a sustainability perspective (i.e. intra-generational equity). Knowledge generation. For a long, long time, Western scientists have valued specialisation. Knowledge has been divided into disciplines and sub-disciplines. Any given (modern) scientist knows a lot about a very narrow set of issues. As Konrad Lorenz put it (as I’ve learnt from my dear friend Tibor Hartel): “Every man gets a narrower and narrower field of knowledge in which he must be an expert in order to compete with other people. The specialist knows more and more about less and less and finally knows everything about nothing.” From a sustainability perspective, we’re now arguing for re-balancing knowledge generation. We’re arguing that having lost sight of the whole has caused all kinds of problems; and that we must get out of our disciplinary silos and embrace different ways of knowing. That’s where the terms interdisciplinarity and transdiscipinarity stem from. Supply of ecosystem services. As famously summarised in Jon Foley’s paper in 2005, and also highlighted in the Millennium Ecosystem Assessment, the ecosystem service bundles of intensively used agricultural landscapes are highly skewed towards provisioning services – while everything else is taking a heavy toll. Many scientists have argued for more balanced sets of ecosystem services. Recent concepts such as “ecological intensification”, for example, have suggested that we can have high levels of provisioning services while also having higher levels of other services – advocating a more balanced set of services, in other words. Beneficiaries of ecosystem services. Recent work on ecosystem services has highlighted that the benefits of ecosystem services typically do not reach all possible beneficiaries equally. Rather, some people get a lot, while others get very little. Perhaps not surprisingly, one might argue that those places where the bundles of ecosystem services are least balanced might also be those places where the benefits are least equitably distributed… time to re-balance both, perhaps? Resilience versus efficiency. Last but not least, an obvious example is Meffe and Holling’s classic “pathology of natural resource management”. They argue, basically, that a desire for narrowly focused efficiency has undermined the resilience of natural resource systems; making them less able to absorb shocks and continue functioning. Perhaps this has been obvious all along, but I was quite struck really by how widespread this phenomenon of “need for more balance” appears to be. From personal lives, to ecosystem services, to knowledge generation … and I’m sure there are many more examples I could have included. Have you ever thought that sustainability science seems to be missing the point, half the time? That’s we’re just re-arranging deck chairs on the Titanic, and that we’re fiddling around the edges? Well — you’re not alone. A group of eight scholars from Leuphana University Lueneburg (myself included) got together early in 2014 to write a project proposal on precisely this. And just a short while ago we found out that our proposal was successful, funded through an exciting initiative by the German state of Lower Saxony to fund excellence in sustainability. Our new project is called “Leverage Points for Sustainability Transformation”. Conceptually, we start with an idea by Donella Meadows, which she published in 1999, in an essay called “Places to Intervene in a System“. Her idea was that there are many ways to intervene in complex systems — but some of these ways are not particularly influential (they have shallow leverage), while others are highly influential (they have deep leverage). Looking at the list of leverage points identified by Donella Meadows (see above), one might argue that a lot of sustainability science has focused on the things on the left — on relatively shallow leverage points. Think about the “reform” of Europe’s Common Agricultural Policy, of laws to ban incandescent light bulbs, or maybe even of REDD+. These are all good things, but it seems they are only small steps in the right direction; while the forces for un-sustainability continue to operate with the same strength as before. Arguably, it’s time for sustainability science to more routinely look at the things with deeper leverage — on the right hand side in our graphic above. Our new project will try to do precisely that. For the purpose of convenience, in our new project, we will look at leverage points within three spheres, which for convenience we labelled restructure, reconnect, and rethink. 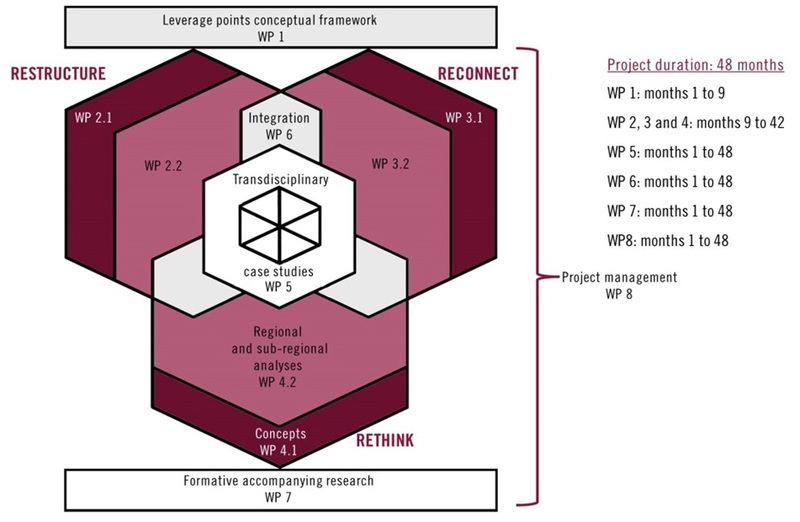 Restructure will deal with the role of institutions; reconnect with relationships between people and their natural environments; and rethink will critically investigate what types of knowledge are needed to advance sustainability (including from outside academia). As focal themes, our new project will focus on food and energy; and as case study areas, we will compare Lower Saxony (in Germany) with Transylvania (in Romania). The project is designed to run for four years, and will start in spring 2015. There will be four postdoc positions and eight PhD positions starting in mid-to-late 2015. Stay tuned! The other PIs on this new project are (in random order!) Ulli Vilsmaier, Dave Abson, Henrik von Wehrden, Julia Leventon, Thomas Schomerus, Jens Newig — and our speaker, Daniel Lang. My response is that, in its own right, complaining of course does not do anything. However, as a scholarly community, what we talk and write about shapes or influences scientific and broader societal discourses. For example, a current discourse that many ecologists feed into is centred around the idea of environmentally benign agricultural production. Especially in a food security context, it would be possible for ecologists to feed less energy into this discourse, and instead think more about the intersection of biodiversity conservation with education (see my presentation in the previous blog post). Or – equally possible in principle – ecologists could take a systems perspective, and see whether systems are actually designed to meet objectives such as biodiversity conservation or sustainable development. Many systems were not designed for these purposes, and so we should not be surprised if they do not deliver outcomes that they were never designed to deliver in the first place. If scholars were to routinely point out inconsistencies between what our systems were originally designed to do and what may be a modern set of societal goals (e.g. sustainable development), this would create a different discourse from what we see today. In stylised terms, it is thus feasible that sustainability scholars help “create” (or strengthen) a discourse around societal goals and values, rather than continue to feed into discourses that may well amount to re-arranging deck chairs on the Titanic. These two ways of engaging with the world – being policy-relevant versus asking uncomfortable questions – can and should go hand in hand. Of course it makes sense to work within existing structures and paradigms to improve sustainability outcomes wherever possible. But ultimately, unless we also challenge those structures and paradigms to keep up with modern (and long-term viable) societal goals, we may win many small fights but ultimately lose the overall battle. From my perspective, it would be helpful if a larger proportion of scholars working on sustainable development, in a larger proportion of their work, highlighted the underyling problems of our sustainability crisis and the need to address those. This would alter dominant discourses, thereby creating momentum for more fundamental societal changes which very likely, ultimately will be required. Building momentum in this way means engaging with society at large, and not singling out policy makers as the single most important “end users” of scholarly work. Many societal actors play important roles in setting the overall direction the world is heading, including scientists and “ordinary” citizens – and if it is the overall direction we are worried about, it is not just policy makers that we need to talk to. In short: being policy-relevant is useful, but as an end goal for a sustainability science community, it is not enough. The Sheffield Institute for International Development recently launched a new collaborative project, which aims to identify the 100 most important questions for international development. You can participate in this project by contributing questions that you think are important here. Views on the likely usefulness of this kind of exercise will very likely be divergent. On the negative side, one might argue that highly focused questions fitting the above format will – by definition – not help to address the deep, fundamental issues that we urgently need to grapple with. On the positive side, it’s likely that the questions being generated won’t go unnoticed by key international players – and on that basis, I’d argue it’s worthwhile to contribute some questions. Given clear evidence that humanity is violating planetary boundaries, which concrete steps can be taken to move away from ongoing material growth as an unquestioned global development paradigm, and by who? Given the important but under-recognised role of value and belief systems for development pathways, which incentives, institutions or communication strategies should be used to encourage societies at all scales to question and reflect on their dominant value and belief systems – for example regarding ongoing material growth, and diets rich in animal protein? Given the interconnected nature of social and ecological phenomena, which properties of social-ecological systems are conducive to sustainability, for example at the landscape scale? Given the ongoing malnourishment of nearly one billion people, despite growing per capita food production globally, which policies other than those focusing on increasing food production should be of primary global importance? Given the association of increasingly loose connections between people and ecosystems with increasingly unsustainable patterns of ecosystem use, what would be viable visions for modern social-ecological systems that facilitate new, genuine connections people and ecosystems? I wrote these “big and broad” questions (rather than more specific ones) because I think it is important that this initiative pushes boundaries. Identifying the 100 most important questions for international development without questioning the paradigms underpinning global un-sustainability would be entirely meaningless, to my mind. If you agree, I suggest you contribute your own questions that push boundaries to this process via the project’s website. I think this project is an important opportunity. But I also think it’s important it does not end up dominated by imminently doable but essentially superficial questions. I just received the following email. It relates to a consensus statement by scientists about the need for urgent, bold action for sustainability. Please read the message below, follow the link, and HELP DISTRIBUTE this. It is headed, and has been endorsed, by some of the best ecologists in the world. Thank you! We are writing to express our deepest gratitude for your signature on the Scientists’ Consensus on Maintaining Humanity’s Life Support Systems in the 21st Century. The statement was launched May 23, 2013, with a joint presentation by participating scientists and California Governor Jerry Brown, leader of the world’s ninth largest economy, and with an announcement in Nature on May 30, 2013 (in the Correspondence section, attached). Representative news links about the initial launch are pasted in at the end of this e-mail. As of May 21st, the statement had been signed by more than 520 prominent scientists (=YOU) from 44 countries that cover most of the world, including dozens of members of the U.S. National Academy of Sciences and equivalent scientific bodies from other countries. Our next goals are to deliver the statement to President Obama, all members of the U.S. House of Representatives, the Senate, and all state governors, and ultimately to leaders throughout the world in both government and business. For the consensus statement to have an impact, it will need strong endorsement by thousands of scientists and at least tens of thousands of members of the general public. Since the launch on May 23 when we opened signing to everyone, we have received hundreds of new signatures per day, and have added citizens of more than 10 additional countries. The response has been remarkable! We will carry on with our work, but you can continue to help as well. Please help to get the word out to family, friends, business leaders, politicians, other scientists. The document is now open for all global citizens to sign. 2) Please continue to widely broadcast the statement and the opportunity to sign it on your social media networks, such as e-mail, twitter, and Facebook. to our planet. As scientists who study the interaction of people with the rest of the biosphere using a wide range of approaches, we agree that the evidence that humans are damaging their ecological life-support systems is overwhelming. •Climate disruption­–more, faster climate change than since humans first became a species. •Extinctions–­not since the dinosaurs went extinct have so many species and populations died out so fast, both on land and in the oceans. •Wholesale loss of diverse ecosystems–­we have plowed, paved, or otherwise transformed more than 40% of Earth’s ice-free land, and no place on land or in the sea is free of our direct or indirect influences. •Pollution–­environmental contaminants in the air, water and land are at record levels and increasing, seriously harming people and wildlife in unforeseen ways. •Human population growth and consumption patterns­–seven billion people alive today will likely grow to 9.5 billion by 2050, and the pressures of heavy material consumption among the middle class and wealthy may well intensify. 5. Human Population Growth and Resource Consumption. Is this a waste of time? Maybe. Maybe not. I have had various bits of feedback on the letter, ranging from “great initiative”, to “too vague”, to grumpy rants that none of this ever does anything anyway. One thing should be clear: I don’t believe that this particular letter is perfect. I don’t know what perfect would be. I do know though that doing nothing is even less perfect. Regarding the somewhat vague appeal in the letter: this is not because I couldn’t think of something more specific. My view is this: change will only come if many people believe change is needed. That, in turn, will only happen if the issue of sustainability (and the fundamental problems standing in the way of sustainability) finds its way into discourses in the public domain. This could be in local politics or in church groups, or in the UN. Doesn’t really matter, but unless fundamental issues such as material growth, leading a “good life”, equity, justice, obligations to other species, and so on manage to get on the radar at least — well, then nothing will happen. So the letter is vague because the answer is not 42, but in fact requires discourse and deliberation at all levels of society. Ultimately, I believe if we can have a conversation, more prominently, on what we (as humanity) truly value, the outcome would not be that we believe in greed and infinite material growth. I’d rather go with something the Dalai Lama once alluded to — that humans are inherently good, but their heart of gold may be covered by layers of dust. The goal of discussions about what we value, what is a good life, and so on — continuing this metaphor beyond its safe limits … — would be to scrape the dust off people’s hearts. Finally: this is not “policy advocacy” beyond what scientists should do. I’m not telling any politician or any local leader what they should do. I’m simply saying we ought to reflect whether what we do (collectively, as humanity) actually achieves what we strive for. Anyway, enough ranting and raving. Go sign the letter, if you agree with it, and do help to distribute it. Unless many people sign it, we know what it will do: nothing.